Bridesmaid heart pendant on a silver tone chain, measuring 40cm’s with a further adjustable 7cm’s. This is the perfect accessory for your beautiful day and will make a special gift, in our gorgeous white gift box with a pink silk bow. 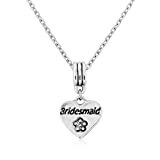 This entry was posted in Wedding Store and tagged Adjustable, beautiful, Bridesmaids, Chain, Gift, includes, Necklace, Silver, Tone by Formal Affair. Bookmark the permalink.